• Apparatus for 3 weapons, F.I.E. approved, also suitable for high level competitions. • Very reasonable price, making it interesting for all fencing clubs. Now everyone can smarten up their club and make use of this amazing signaling apparatus! • Information visually displayed in various colours for clearer reading and a better visual impact. 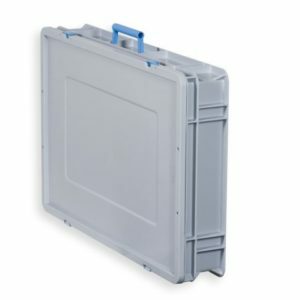 Although large digits are used, the FA-07 remains moderate in size (55x35cm), allowing it to be easily transported in the carrying case provided. • Scorer: height of the digits 13cm, legible over 55m. • Chronometer and Match Counter: height of digits 9cm, legible over 35m. • Red, Green, and White lights signaling hits: brightly lit, legible at 180° as the lights protrude from the front panel. • Red and yellow cards, priority and lights signalling faults: visible over 25m. 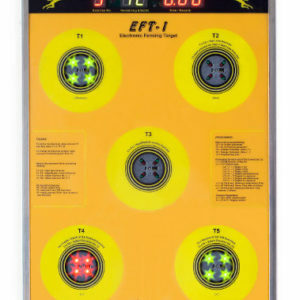 • The back-lit graphic display panel can simultaneously visualize all information: selected weapon, names and nationalities of the fencers (if the competition is operated on-line), power supply voltage, sound volume, etc. The information is displayed in 5 languages. • Use of highly efficient LEDs which greatly reduce energy consumption(typical 0.5A), facilitating the apparatus to be battery powered; the battery listed in the catalogue, art. 828, enables the uninterrupted use of the FA-07 for 10-12 hours, while a 70Ah car battery lasts 120 hours. • Sturdy infrared REMOTE CONTROL provided, which can also be connected via cable, as required on high level competitions: infrared rays are effective at a distance of over 20m; lithium-ion battery can be recharged with the cable provided. Charge lasts about 300 competition hours. Useful indicators: low battery signal, battery recharging signal, transmission key. Remote control operated functions: chronometer, hits, matches, red and yellow cards, priority, change of weapon, change of fencers’ position, management of on-line matches, etc. • ETHERNET port. The FA-07 is the first fencing apparatus equipped with an Ethernet port connection. It provides two extremely useful functions: 1) a LAN connection which allows for easy management of a competition (see chapter 6 of the PDF document "FA-07 Users’ Handbook"); 2) the possibility to update the FA-07 software via a computer, which saves receiving and inserting components into the apparatus due to changes in rules. • Two Rs422 ports for sending all FA-07 data to external data gathering, visualization, and Video-refereeing systems, and for TV-Superimpositions. Three "Serial Data" ports to communicate with other FA-07s and other Favero Electronic Design devices. All the 5 ports are opto-isolated to protect fencers from dangerous high voltages. • REPEATER function. Several FA-07s can be connected in a cascade configuration: the first one works as a piste apparatus and the others as repeaters. Connections can be made with regular, easily available and implemented, 4-wire telephone cables, which can be as long as 100m. Those provided are 15m and 2.5m in length. It is also possible to invert the displayed information on an FA-07 repeater so that, when placing two FA-07 apparatuses back to back, a 360° visualisation can be obtained with all information and lights appearing on the same side. • Transparent shock-resistant front piece, and sturdy metallic case. • Protected against errors in power supply voltage (if too high the FA-07 will not switch on) . • Sound volume can be adjusted from zero (off) to 3 (max). • Different sounds distinguish the sound of hits from those signalling end of chronometer time and those signalling faults. • Changing of fencers’ position. • Can work in Épée-Training mode, to signal a quick succession of hits. • Possibility to enable automatic counting of épée hits. • 10-minute pause button for dealing with any medical interventions. • Automatic recognition of the "STM-Wireless" system, which can be connected via the appropriate connector. • Prearranged for attaching and connecting Towers Lights (not included). • ACCESSORIES PROVIDED: 90-264V/12Vdc power supply unit, remote control, carrying case, 15m and 2.5m cables for connecting to repeaters, 10m and 1.3m for connecting to remote control and for recharging the remote control battery. • Size and weight: 55x35cm, 8.1kg (carrying case, power supply unit, remote control and cables included). • Power supply: 12Vdc (10.6-14.5Vdc), typically 0.5A, maximum 2.3A with towers lights connected and switched on. 90-264V/12V power supply unit included.